There Will Be Hell To Play! SAN FRANCISCO & LONDON – August 9, 2012 – And now, what we have all been waiting for … SEGA® Europe, SEGA® of America Inc. and Arkedo are happy to reveal Hell Yeah! Wrath of the Dead Rabbit™ will be available to download in North America on September 25 for PlayStation®Network, September 26 on Xbox LIVE® Arcade for the Xbox 360® video game and entertainment system, and October 3 for PC digital download for $14.99/1200MSP/$14.99 respectively. In Europe, Hell Yeah! Wrath of the Dead Rabbit will be available for all three platforms on October 3 for 1200MSP/£9.99/€12.99/AUD$19.95. MEDIA ADVISORY: Puzzle-Platforming Adventure Papo & Yo Now Available for Pre-Order, Cinematic Launch Trailer Unveiled! MONTREAL – August 7, 2012 – Minority Media, an independent game development studio, along with Sony Computer Entertainment America (SCEA), have announced that puzzle-platformer Papo & Yo is now available for pre-order via the PlayStation®Network (PSN) for $14.99 (or $11.99 for PS PLUS members). For the full preorder details, visit the PlayStation blog at blog.us.playstation.com/2012/08/08/papo-yo-the-adventure-begins-on-psn-next-week. The studio has also unveiled a special surprise for fans: an early look at the official cinematic Papo & Yo launch trailer. Created through a partnership with the experienced filmmakers at Rezolution Pictures and talented Montreal director/director of photography Alfonso Maiorana, this trailer shows the start of Quico’s story through an incredible mix of live-action and in-game footage. To view it online, head to www.youtube.com/watch?v=Rn23bgfj_f4. Continue reading MEDIA ADVISORY: Puzzle-Platforming Adventure Papo & Yo Now Available for Pre-Order, Cinematic Launch Trailer Unveiled! 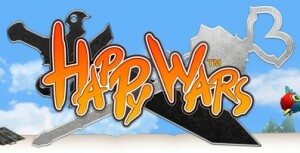 TOKYO – May 31, 2012 – Toylogic, a leading developer of console games worldwide, today announced that their upcoming multiplayer action title, Happy Wars, will be available to play for the first time ever in North America next week at the Electronic Entertainment Expo in Los Angeles. Interested attendees who’d like to give this unique title a try can do so at the Microsoft booth, #4100 in the West Hall of the Los Angeles Convention Center.